The curtain has risen on a new piece of writing, by who can only be described as one of our great new South African playwrights, Robert Fridjhon. Given free reign to write about what he wanted to write about, Robert has chosen a subject matter that has fascinated him for a long time, the “story” behind the song, Bohemian Rhapsody. Shrouded in enigma and mystery for more than 40 years, Brian May has said that even if he did know where the inspiration for the song came from, he wouldn’t say. Freddy Mercury was quite close to a Journalist who wrote an autobiography of the band, but even he wasn’t able to glean the origins of or inspiration for the song from Freddy. “What if” are the words that best describe Bohemian Rhapsody– The Untold Story, and Robert has woven a tale of murder, mystery, art forgery and dodgy characters around the lyrics to one of the most popular songs of the 20th century. The imagery is superb and one is drawn immediately into the life of the doomed Scaramouch. “Yes, yes, yes,” you might find yourself saying as the plot unfolds. It’s completely plausible. Fridjhon also proves himself an actor of great versatility and skill, playing all the characters, switching from the doomed Scaramouche to the coarse, crass, brutal thug Tony with ease-accents and all. 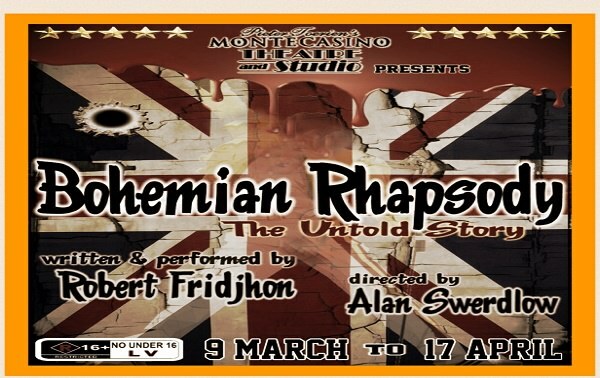 Bohemian Rhapsody-The Untold Story runs at Pieter Toerien’s Montecasino Studio Theatre until 17th April. It has a No Under 16 age restriction for Language and Violent imagery.